Among his basketball accolades, Bruce Pearl is the second-fastest NCAA coach to reach 300 victories. He was the first coach to lead the Volunteers to a national #1 ranking. On November 17, 2009, Pearl was able to record victory number 100 at Tennessee, the second fastest UT coach to reach the century mark. 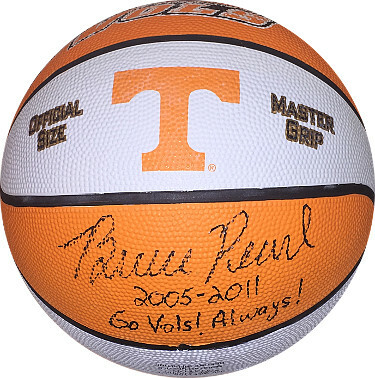 Bruce Pearl has hand signed this Tennessee Volunteers Game Master Basketball with dual 2005-2011 & Go Vols! Always!! inscriptions. Beckett Authentication Services-BAS Hologram # A86253 w/ Beckett Full Letter of Authenticity.